What a sweet book! 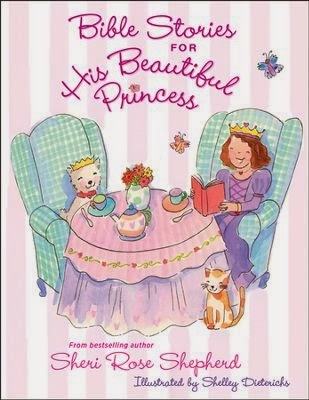 BIBLE STORIES FOR HIS BEAUTIFUL PRINCESS is written by bestselling author Sheri Rose Shepherd, and adorably illustrated by Shelley Dieterichs. The book is medium-sized, easy to handle, and uses lots of little girly colors like pinks and purples to make it appealing to all little princesses. There are 37 short chapters, so that’s enough for more than a month’s worth of devotionals. Each devotional starts with a verse from God’s Word; then the main text has a couple of short, easy to read paragraphs that coincide with the verse; then there is a short prayer; and, finally, a "Princess Jewel" which is a simple truth/summary of what was just read. At the end of the book, there is a "letter from God" that shares what a special treasure your little girl is - a beautiful princess in God’s eyes. Then, the final section is a salvation prayer that can be used if needed. I can see that the main purpose of this book is to share how much God loves and cares for His children and how He wants them to know Him better. It’s a special book written for the special little girls in your life. It would make an excellent Easter gift! Disclaimer: Tyndale House Publishers has provided me with a complimentary copy of this book for review purposes. I have shared my own opinion.